Real PCE per person was less in October than in August. Year-over-year, it has grown 1.4 percent. Real GDP per capita has grown 1.7 percent year-over-year. We are fortunate to have their shoulders to stand on. I find vast amounts of Elmendorf-era CBO research results to be interesting and rock-solid reliable. The plain fact is that my books and my University of Chicago lectures highlight such CBO material. I would be handicapped without it. Elmendorf-era CBO updates as research progresses, without being gullible. Is there any other DC institution in that category? Later when I have more time I will elaborate and document these points, and explain why the detractors are confusing the forest with the trees. "Obamacare is, in all important respects, identical to Romneycare." Overall, the ACA erodes nationwide average work incentives about eleven times more than Romneycare did in the state of Massachusetts . Table 10.1 is a good summary of why the differences are so dramatic: the amounts involved and the fraction of the potential workforce presented with a new income or employment tax as a consequence of health reform. 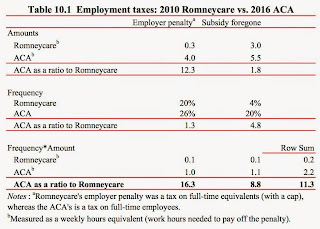 The primary difference between Romneycare and ACA employer penalties is the nominal amount: $ 295 versus $ 2,000 (plus health cost inflation), respectively. Also significant are the facts that the ACA penalty is not business-tax-deductible and that Massachusetts employers are especially likely to offer health insurance even without a penalty. The subsidized coverage in Massachusetts has barriers to participation that are absent from the ACA and thereby make Romneycare’s implicit [full-time employment tax] less significant. Romneycare came after other permanent forms of assistance for Massachusetts workers leaving [jobs with health coverage], whereas, before the ACA, the federal government had no significant and permanent program for assisting nonelderly nonpoor adults with health insurance while they are not working. Accounting for the prevalence of various taxes, I find that the ACA’s implicit income tax (not shown in Table 10.1) is about eleven times greater than Romneycare’s. I give the CBO a lot of credit on this. Unlike Professor Krugman, the CBO never fell into the trap of saying that Romneycare= Obamacare, therefore Obamacare has no noticeable effect on the labor market (CBO 2012). Updated. I answer commenter Veritas with the excerpt below from Chapter 10 of Side Effects. I believe that Professor Gruber videos refer to the Medicaid waiver but, as my excerpt notes, Romneycare had even more federal funding than that. At the 4:58 mark, Dr. Aaron acknowledges that "there is a tradeoff." That was a big surprise to me, because Dr. Aaron was the lead signatory on the economists' letter to Congress saying that there is no tradeoff: the ACA both helps people and grows the economy. But then in this economists' letter to Congress and the American public, the same parties are claiming that the effect of the ACA on health care cost growth is so tremendous (in the direction of less cost) that it would create up to 400,000 jobs EVERY YEAR! Another (unrelated and) excessively truthful part of this video starts just before the 24:00 mark "The American public doesn't actually care that much about the uninsured. ...A lot of the uninsured don't care about the uninsured." A job, Mr. Mulligan explains, "is a transaction between buyers and sellers. When a transaction doesn't happen, it doesn't happen. We know that it doesn't matter on which side of the market you put the disincentives, the results are the same. . . . In this case you're putting an implicit tax on work for households, and employers aren't willing to compensate the households enough so they'll still work." Jobs can be destroyed by sellers (workers) as much as buyers (businesses). Mr. Mulligan reserves particular scorn for the economists making this "eliminated from the drudgery of labor market" argument, which he views as a form of trahison des clercs. "I don't know what their intentions are," he says, choosing his words carefully, "but it looks like they're trying to leverage the lack of economic education in their audience by making these sorts of points." This is NOT the video from UPenn. This was is from Wash U, and I believe that Fox News uncovered it. Jump to 30:11 for the discussion of how to undo the tax subsidy for health insurance. And watch for 90 seconds. #Grubergate : anticipated on the last page of "Side Effects: The Economic Consequences of the Health Reform"
The book was also written to show that economics did not, and does not, have to be ignored or superficially considered at the policymaking stage. ...Political pragmatists may claim that it is sometimes necessary to ignore economic consequences to support a worthy effort. Even without its pessimistic assessment of the ability of voters to receive information, this argument has been contradicted many times in history when unintended consequences overwhelmed promised benefits. Italics added. Mulligan, Casey B. Side Effects: The Economic Consequences of the Health Reform. JMJ Economics. Kindle Edition. Providers in 2014 save about $550 per person who gets insured because of the ACA, only small part of that $550 is an efficiency gain (the rest is a transfer to hospitals). Meanwhile, I estimate that the labor market efficiency losses are at least an order of magnitude greater, not to mention that the efficiency losses really are losses. Upenn briefly removed its suddenly-viral video of the 2013 health conference plenary session. Thanks for putting it back! Prof. Pauly calls himself "The father of the individual mandate (although not this mandate)"
Prof. Pauly prefers the "Rambo" alternative the ACA's individual mandate. Rambo would put all of the uninsured on a bronze plan without their permission and send them a tax bill for bronze premiums. 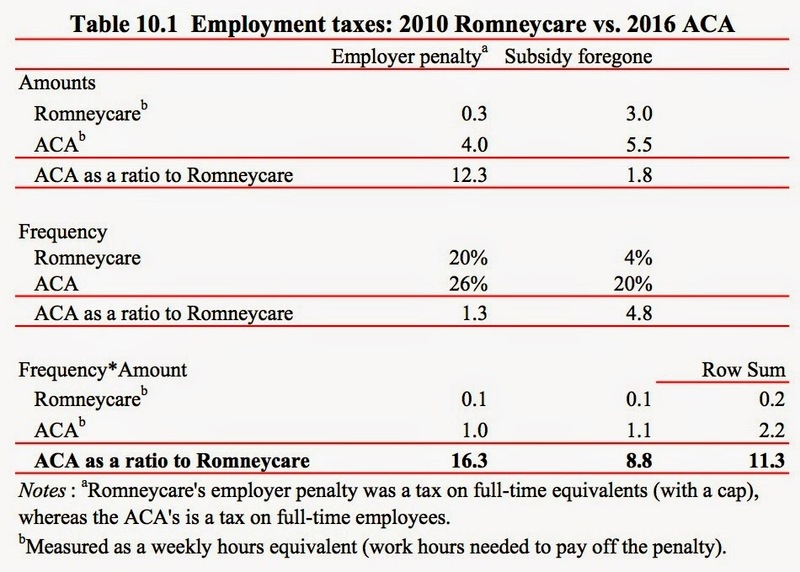 Prof. Gruber claims that the individual mandate penalty should be much larger. Both Professors discuss the Oregon study and it's failure to show a statistically significant effect of health insurance on health. Among other things, Prof. Gruber said that the study results widened his priors without changing their mean. Prof. Gruber wants to expand the subsidies: expand premium subsidies for everybody and cost-sharing subsidies for people under 300% FPL. He is optimistic that the opportunity for such expansions will come as (if?) healthcare gets more expensive. 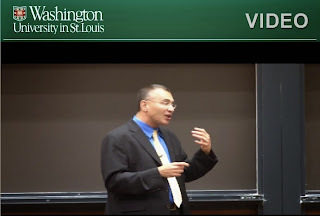 Neither professor acknowledges the law's work disincentives or its large productivity costs. Both professors are clear that they consider the pre-ACA status quo as the relevant alternative for evaluating the law. That's good news for me: my book does the same thing. "...it's not that Obamacare will fail. After all, if the law will just be a debacle, Republicans should let it take effect, ride the catastrophe to overwhelming victory in the 2014 midterms, and then use their massive congressional majorities to repeal it." Ezra Klein and Evan Soltas, 14 months ago. Gordon Tullock died yesterday. He did a lot of innovative work and was highly deserving of a Nobel prize. I especially liked this book. Will Voters Reward the Authors of the ACA for its "unexpected success"? May 26 2013: "the real Obamacare shock will be one of unexpected success"
Normally U.S. Senators seeking reelection win 80% of the time. Thus, to help confirm or deny whether voters agree with the prediction above, on Wednesday we might check whether 9 or more of the 12 Obamacare authors are awarded with another term. It will also be interesting to count how many campaign rallies feature signs saying "Don’t let the government get its hands on Obamacare!" Part of the fun of voting is imagining that the vote makes a difference. To assist in this effort, the Cook County Clerk now emails absentee voters that their ballot has been received. Wisely, the Clerk does not include a tally of how many elections are uncontested. We have received your voted ballot for the November 4, 2014 Gubernatorial General Election. However, no ballots are counted until election day when all other ballot types are tallied.